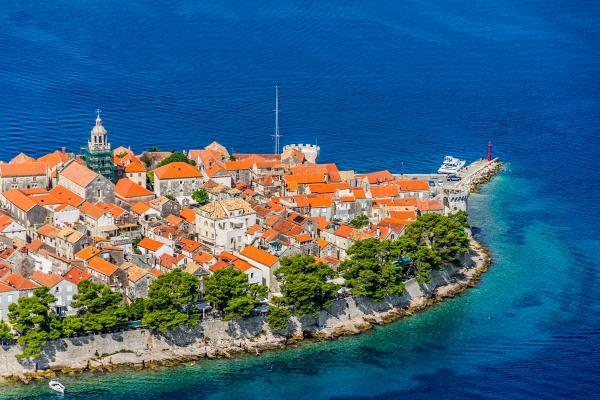 From Venice, set sail for Croatia and its many hidden treasures on this 8-day voyage. Le Lyrial slips effortlessly through the turquoise Adriatic Sea, wending her way between necklaces of islands dotted here and there off the Dalmatian Coast. 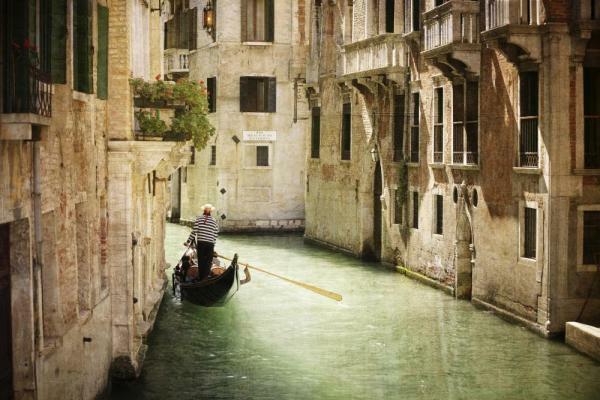 There are cities which thrive on their legend – and Venice, the City of Doges, is one of these with its many offshoots lined with multi-colored stonework and its black gondolas. Explore the wild beauty and pearls of the Adriatic: ancient ruins, a wealth of art, and timeless cities just waiting to be discovered, such as Dubrovnik, Kotor and Rovinj. Arrive in Venice and transfer to the pier to embark Le Lyrial. Explore Venice, the proud and eternal, and fall in love with the charm of the innumerable treasures of the Serenissima: Saint Mark’s Square, the basilica, Doges palace, the Grand Canal, and the gondolas. Yet, secret Venice is also waiting for you to explore its little interlacing streets and canals, to ramble through its squares, and to push open the doors of its churches. The city’s extraordinary heritage shouldn’t stop you from enjoying a glass of Spritz and a few tramezzini. Arrive at Korcula Island just after lunch and dock at the town of the same name. This harbor town has a very special location, presiding on a spur on the northeastern coast of the island of Korcula. The ramparts in its medieval district provide perfect vantage points over the Pelješac peninsula. To get there, you can take the monumental staircase in the Revelin Tower. Another way is to climb the steps in the shade of palm trees from the Morska Vrata(Marine portal). See the bell-tower of Saint-Mark’s Cathedral rise above you as you make your way through the little streets. This landmark helps you locate the house where Marco Polo was born. The island also has some of its own famous wines like the red Plavac and the white Posip. - Korcula Walking Tour: Arrive in the old town through a monumental staircase which joins the Revelin Tower. Then, discover St. Michael Church and St. Marco Cathedral which is without any doubt the most beautiful building in Korcula. After having seen the Bishop’s Palace and its Museum, pass by the Marco Polo house, where the famous explorer is said to have been born in 1254. - Buggy Safari: Start the tour with a scenic boat ride from town of Korcula to Lumbarda village. Upon arrival, follow a 15-minute safety briefing before you board your own 2-seater buggy convertible. Drive over gravelly terrain and pass by olive groves and vineyards. Arrive at Przina Beach and enjoy 90 minutes of free time for swimming. After the swimming portion continue with the buggy ride for about 60 minutes. Upon arrival in Lumbarda embark the same boat and enjoy the return cruise to Korcula town. A light lunch consisting of specialties like fish pate, cheese, anchovies, salad and home-made bread is served. - Kayaking & Snorkeling: Start your tour with a scenic and relaxing ride around the Korcula islets by motorboat to the village of Lumbarda, where the kayak and canoe fleet is located. After the compulsory safety briefing, the kayaking or canoe adventure begins. Your skipper escorts you to the secret beaches of Korcula Islets, an interesting cave, and those enchanting spots, usually the most scenic and isolated spots that can only be reached by sea. At the end of your kayaking tour, re-board the motorboat for the 45-minute cruise back to Korcula. - Korcula Hiking Tour: Board your mini-van for the ride to Zrnovo where your adventure begins. Experience the unique combination of the sea and the mountains. Walk across the lively Korcula region and follow the trail through vineyards and Mediterranean forest. Short breaks are made occasionally in order for the tour guide to introduce you to the historical and natural characteristics of Korcula Island. After the hike take a break in the family estate Belin, where you can have the opportunity to taste local wines, homemade bread, fried zucchini and cheese, or refresh yourself with a lemonade. Disembark in Sibenik for your excursion to Split – an ancient city centered on the formidable Palace of Diocletian, a UNESCO World Heritage Site. An extensive and well-preserved structure, the palace contains Split’s medieval town within its walls, making it the only palace continuously inhabited since Roman times. - Krka Waterfalls: Reach Krka National Park by coach as far as the famous falls. On its journey, the Krka flows through waterfall after waterfall before forming a lake and then narrowing down again to Skradijski Buk. Stop at Skradijski Buk on river banks embellished with mills and wash houses. Have the opportunity to discover the ethnological museum located in the park and take the road back towards Split (1 ½ hours). Arrive to Split at noon. This town offers cultural visits in a seaside atmosphere. Close to the seafront shaded by palm trees, the historical center listed as a UNESCO World Heritage site boasts a unique building: the Diocletian’s Palace. Here you can explore its galleries, courtyards with carved columns, as well as a former mausoleum converted into a church, namely Saint Domnius Cathedral. If you get peckish, stop off at a terrace in the Pjaca, the main square in the old town. - Split & Cetina River Countryside: Embark your coach for the 30-minute scenic drive along the coast, via a mountain road, to the town of Omis. Board a river boat for a cruise along the Cetina River. The area around the river is known for its numerous archaeological findings from the Middle Ages, Roman times, and even the Stone Age. After a 45-minute boat ride, land on Radman’s Mills for a snack and refreshment. From here you can walk into the forest or enjoy the view of the river next to this old mill. Upon visiting this charming natural setting, return to the Town of Split for a 45-minute guided walking tour visiting the palace cellars, the cathedral, and the Golden and Silver Gates, among other sites. - Split Walking Tour & Diocletian Palace: Start with the walking portion of the tour after a short walk (15 minutes) from the port to the Old Town. Start with a visit of the Palace on the ground gallery that is still very well preserved. It offers a good view at how the life in the Palace was organized. Then visit the very interesting Cathedral of St. Duje (patron saint of the city). Explore the charming Temple of Jupiter, turned into the baptistery by Christians. Finally, cross the palace of the southern gate to the north door and discover the ramparts and the immense "statue of Gregory of Nin". Arrive to Dubronovik in the early morning. Emblem of the Dalmatian coast, Dubrovnik is magnificently positioned on a rocky spur. History is sovereign here, in this ancient city now listed as a UNESCO World Heritage Site. Feel surprised by the proportions of La Placa, the central drag through the city. The sheer width of it can be explained by the fact that it straddles a former lagoon. The elegant houses along La Placa are built in the legendary travertine stone. At Pile gate, be greeted by the statue of the patron saint of Dubrovnik, and admire the coastline as you walk along the ramparts. But what’s inside Fort Saint John, adjoining the outer walls? A maritime museum and an aquarium featuring rare fish from the Adriatic. - City Walls & Lokrum Island Kayaking: Set off on a tour that skirts the city’s famous city walls by kayak, taking in fortresses, caves and islands along the way. Row between the forts of Bokar and Lovrijenac, then leave the forts behind and steer a course round the city walls to Lokrum. Finally, stop at the island for refreshment, and enjoy some time at leisure to discover the island or have a swim. - Adriatic Sea Adventure: Board an inflatable zodiac boat in the Old Town Port and cruise along Lokrum Island. Continue with a cruise along the Lapad Peninsula passing close by the Grebeni Lighthouse towards Kolocep Island. Cruise to the outer side of Kolocep Island for snorkeling in the Modra Spilja cave, then proceed towards the other side of Kolocep Island. Then, choose between a short tour of Donje Celo village or swimming on a sandy beach. Finally visit Lopud Island, which has a very popular sandy beach. A guided tour allows you to discover this island, followed by time on the beach for swimming. - Konavile Biking Tour: This bike-tour leads you through an oasis of cypress, vineyards and olive groves, as well as villages that still reflect the traditional culture of old Dubrovnik. Start your adventure with a one-hour scenic drive from the port to the village of Zastolje where bikes are waiting for you. Your fist stop is at the old mill Divanovi where you are welcomed with dry figs, cheese, Dalmatian prosciutto, natural juice, coffee and cake. Go back to your bike and head to the wine tasting facilty Martinovic, located in Zasjotlje. Return to Dubrovnik after the wine tasting. - Republic Monuments and City Walls: This walking tour takes you into the heart of the Old City of Dubrovnik, a UNESCO World Heritage Site. Visit the 17th-century Cathedral, with its rich treasury, gold and silver relics. Discover the Rector's Palace where you can admire its first class collection of artifacts, furniture, and arms. Then it is on to the Maritime Museum situated in the fortress Sveti Ivan where you can discover the maritime affairs of Dubrovnik and Croatia as a whole. Reach the top of the wall and walk along half of the wall's length. See the gorgeous Minceta Fortress, St. John`s Fortress, and Bokar Fortress. The charming red terra cotta roofs of Dubrovnik`s old houses spread out before you. - Brubronovik Walking Tour & Cable Car: The pleasant stroll through the streets of this medieval town begins in the old port of Dubronovik. Start the tour with a visit to the Franciscan Monastery whose cloister ranks among the most inspiring sites of the city. After visiting the monastery, head to the Cathedral a place that houses one of the finest collections of golden and silver relics in Europe. Continue your visit with the Dominican Monastery and its collection of Renaissance paintings. Finally, stop at the Dubronovik cable car and take a ride up to the top of Srd hill from where you can admire Dubrovnik Old town, Elaphite Islands and Lokrum. Arrive in Kotor in the morning. Nestled at the end of a bay surrounded by wooded mountains, the town of Kotor is listed as a UNESCO World Heritage Site due to its old town with its medieval architecture. 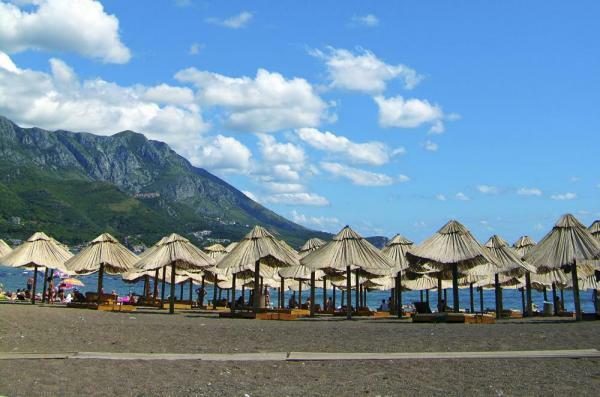 - Mini Tour of Montenegro with lunch: Embark your coach for a drive to Budva and its old town. Along the way, drive around most beautiful coasts and their numerous beaches. Continue to Cetinje, located in the fields at the base of Lovcen Mountain. The village is a treasure of Montenegrin cultural and historical heritage as it was the ancient capital during King Nicolas's 1st reign. On the way to Njegusi, drive through the Lovcen Mountain region, a national park of 6,500 acres which rises to an altitude of 1750 meters, providing the most magnificent views. Return to Kotor taking the road with 25 hairpin bends, and enjoy some free time in the lovely town of Kotor before coming back to the ship. - Bay of Kotor Sea Kayaking: Kayaking tour discovering the wonders of this region. Paddle along to discover the cultural textures, lush landscapes, unique marine life and rich history of Kotor and the surrounding villages. Discover the coastal churches, villages and vistas of Montenegro. No previous kayaking experience is necessary. In this excursion you must paddle approximately 6 kilometers / 4 miles and throughout the tour you have an opportunity to swim, snorkel and simply enjoy the landscapes of the surrounding mountains. - Perast and Our Lady of the Rock: Embark your coach for a 25-minute drive to Perast, an amazing town with almost the same number of churches as the number of inhabitants. Here you can enjoy the scenery and architecture of this old historical town. Then visit the St. Nicholas Church, patron saints of the sailors. Take a 15-minute boat ride to the man-made islet of Our Lady of the Rocks. The stone plateau in the middle of the sea with a church on it is the result of the enduring efforts of generations of mariners. Back in Kotor, follow your guide on a walking tour of the city. - Off Road Adventure in Lovcen National Park: This trip is a combination of asphalt and off road, seaside and mountain scenery, and different climates. Start from Boka Bay, in the town of Kotor surrounded by medieval city walls, to the peaks of the mountain of Lovcen, which is one of four national parks in Montenegro. Driving by the old serpentine road (25 hairpin turns) from where you can see the most beautiful views of Boka Bay, jeeps reach a place called Krstac. From Krstac your trip continues off road, in the direction of Dolovi village where you can take a photo of an authentic Montenegrin mountain place. The road continues to Ivanova Korita, and changes from off road to asphalt road. From this beautiful green valley you go up to Lovcen mountain, a symbol and natural, historical and cultural area of Montenegro. Finally, drive to the Njegusi village, a special place because of its well-preserved folk architecture. Discover Hvar, a fertile island of pale stone houses surrounded by rosemary, lavender, and laurel. The country’s oldest town, Stari Grad, is here on this Dalmatian Island. The town nestles by a cove on the northwest coast, surrounded by dry stone wall structures on the Stari Grad plains. These have been designated a UNESCO World Heritage site because they were built in the time of the Ancient Greeks. From these parcels of land come wines and olive oil manufactured manually. Discover hams and cheeses made by local producers in the upper part of town. The picturesque village of Vrisnik is a good place to try some local produce. - Hvar 4x4 Adventure: From the pier, a short walk takes you to your 4-wheel drive vehicles. After a short drive along a dirt road arrive in Malo Grablje, a small village abandoned decades ago. Upon arrival there is a short walk through that picturesque village founded in the 16th century. Re-embark your vehicles for Velo Grablje and Vidikovac, offering a perfect view of the deepest bay on the island. Next, your drive takes you to the highest peak of the island Saint Nicoleas, offering a 360-degree view of the island and the islands of Brac, Korcula, and Vis. On the way back to the port, drive by vineyard-covered hills, olive groves, and undulating fields of rosemary and lavender. 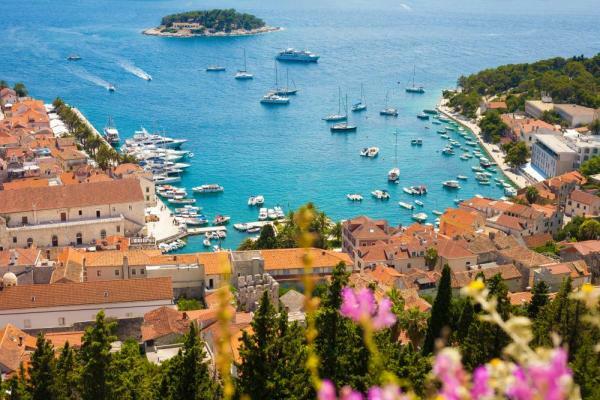 - Walking Tour of Hvar: From the pier, have a walk through narrow tiny streets and reach the Franciscan Monastery built between 1461 and 1471. After crossing the main square, pass by the Cathedral of St. Stephan (outside visit). From outside, it has the characteristics of a Renaissance style and inside a baroque one.Then, visit the Benedictine Monastery before going to the Arsenal; an imposing building built in 1611. After this walking tour and before returning to your ship, enjoy the opportunity to have free time for yourself. - Hiking Villages of Hvar: Meet your guide in the port of Hvar, where the tour starts. Passing through the town towards the bus station your guide gives a short explanation of the town and historical buildings and monuments. From the bus stop there is a 20-minute transfer to the starting point, the village of Velo Grablje. On arrival in Velo Grablje, your one-hour walking tour to Malo Grablje starts, using part of the old trail which in medieval times used to be a main road connecting Hvar with Starigrad on the north side of the island. Head to Milna, where your walk ends, and spend some time on the beach before returning to Hvar town. Time spent on the beach is usually 30 minutes. This morning arrive in Pula, the largest town on the Istrian peninsula. Pula is undoubtedly the most Roman of all Croatian towns. Some of the greatest pages in history were written here, as the breathtaking ancient remains testify. Take your pick exploring the amphitheater, the Renaissance Communal Palace, the Venetian Fort, and others. Stroll through the busy lanes in the old town, enjoying the warm welcome of the locals, and perhaps be tempted to try the famous Kvarner scampi or Istrian ham. - Pula & Olive Oil Tasting: Upon disembarkation from the ship, embark your coach for a drive to a traditional olive oil farm in Vodnjan Village. The Sandi Chiavalon olive oil farm is specialized in growing olives and producing top-quality extra virgin oils. 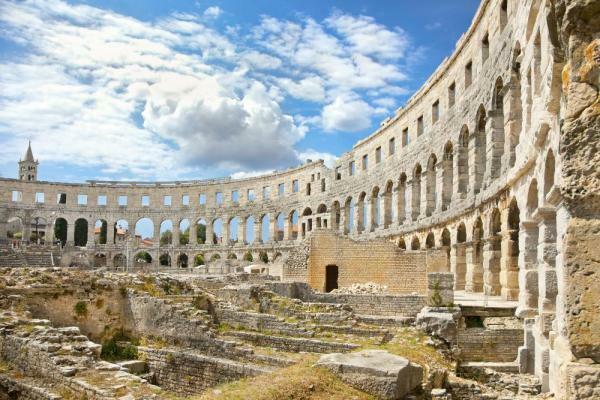 Continue to Pula to enjoy a guided walking tour of the town with visit of the Amphitheater. ​The Amphitheater was first built in timber during the reign of Augustus (2-14 CE). In 79 CE it was enlarged to accommodate gladiator fights by Vespasian and was completed in 81 CE under Emperor Titus. - Pula and its Amphitheater: Walking tour to the Arena and Amphitheater. The Arena was built in the 1st century CE, as the city of Pula became a regional center of Roman rule, called Pietas Julia. The amphitheater was first built in timber during the reign of Augustus (2-14 CE). In 79 CE it was enlarged to accommodate gladiator fights by Vespasian and was completed in 81 CE under Emperor Titus. A series of underground passageways were built underneath the arena along the main axis from which animals and fighters could be released; stores and shops were located under the raked seating. From Istarka Street, discover The Double Gate (2nd and 3rd century), the Hercules Gate, and the Sergius Arch. In the afternoon arrive to Rovinj, a city located in Istria, a region bordering Slovenia. This becomes apparent as you walk through its old cobblestoned town. There are many monuments of Venetian influence here. If you study the Balbi Arch, you can see the winged lion, the symbol of Venice. The bell tower erected beside Saint Euphemia Cathedral was designed like the bell of St. Marc in Venice. From the top of the tower, you can scan the entire historical district. To absorb its quaint atmosphere, take a walk in the ochre and sepia-colored streets leading to bustling squares and terraces shaded by canvas awnings. - Discover Porec: Your tour starts with a scenic 45-minute drive to Porec. Here your walking tour of the town begins with the Episcopal Complex of the Euphrasian Basilica in the Historic Center of Porec. Due to its enormous historical value and beauty the complex of the Basilica was enrolled in the UNESCO World Heritage list in 1997. After the visit to the Episcopal Complex, have some free time in Porec before rejoining your coach for the drive back to Rovinj. - Rovinj Walking Tour: Explore the hidden treasures of this wonderful old city on foot. Narrow streets intersected by covered passageways and archways decorated with ancient frescos are a major feature. You cannot help but notice the Venetian influence and the rich cultural heritage that is omnipresent in the architecture of the tall houses with their warm red-tiled roofs. The highlight of your visit is the Church of Saint Euphemia, a prestigious building dating way back to the 8th century. Disembark in Venice in the early morning. Proud and eternal, Venice has reigned on its lagoon ever since the 6th century. You may think you know this city before even setting foot here. Fall in love with the charm of the innumerable treasures of the Serenissima: Saint Mark’s Square, the basilica, Doges palace, the Grand Canal, and the gondolas. Yet, secret Venice is also waiting for you to explore its little interlacing streets and canals, to ramble through its squares and to push open the doors of its churches. The city’s extraordinary heritage shouldn’t stop you from enjoying a glass of Spritz and a few tramezzini. - Frari & San Rocco: This guided tour starts directly on foot from San Basilio Harbor. Enjoy a leisurely 45-minute guided walk through the lesser-known Venice to reach the Church of Santa Maria Gloriosa dei Frari, commonly refer to as "Frari". Visit the Scuola Grande di San Rocco, protector against plague (which had struck Venice in that century) and fraternity of St. Roch, which was established in 1478 by a group of wealthy Venetian citizens, next to the church of San Rocco, from which it takes its name. At the end of the visits enjoy some free time before returning to the harbor by private watertaxi. - Burano & Torcello: This tour by private boat on the lagoon of Venice allows you to discover two of the famous islands. After a 45-minute boat ride arrive in Burano, 6 miles to the north of Venice, where most of the inhabitants are fishermen or skilled lace makers. Re-embark your boat for the ride to Torcello, the "cradle" of Venetian civilization. A powerful maritime and trading power for a period of centuries, this island played a vital part in the growth of Venice, the capital of Veneto. The highlights are two quite marvelous churches, a reminder of another world and another time: the monumental basilica of Santa Maria and Santa Fosca. Optional excursions are NOT included in the cruise fare. Please contact us for details.